Each year, the National Committee for Quality Assurance (NCQA)® rates health plans based on quality measures (HEDIS)®, member satisfaction (CAHPS)® and NCQA Accreditation standards scores. Based on its rigorous and comprehensive evaluation, the resulting score (and accreditation) is vital to a plan’s market viability because many employers will only do business with NCQA-accredited health plans; federal and many state insurance regulations require insurance providers be accredited by NCQA; and discerning consumers want to know that the health plan they choose is recognized for its high quality. However, many plans lack the expertise, knowledge, resource management skills, and metrics necessary to develop and sustain strong Quality Improvement (QI) programs that consistently receive NCQA accreditation. 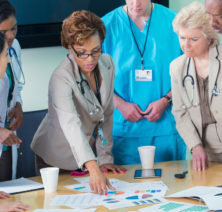 A highly trained QI team has for the past five years supported Johns Hopkins HealthCare’s three health plans: Priority Partners Managed Care Organization (PPMCO); Johns Hopkins Employer Health Programs (EHP); and the Johns Hopkins U.S. Family Health Plan (USFHP), one of 13 such plans in the nation. PPMCO received in 2016 a Value Based Purchasing incentive of $4 million from the Maryland Department of Health and Mental Hygiene. USFHP – High Performance (5.0), with Excellent Accreditation. More information about health care performance measures is available here. Contact us to find out how the the Johns Hopkins HealthCare QI experts can help your organization build a high performing QI program. Click here to learn about Johns Hopkins consultants for other specialties.